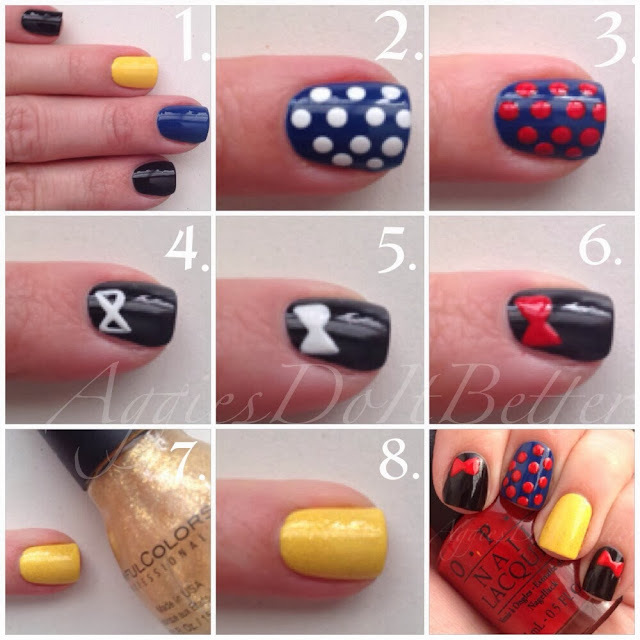 Aggies Do It Better: Princess Week-Snow White Nails plus tutorial! Hey guys! It's Princess Week! The Disney Princess Half Marathon is this weekend at Disney World. I ran this race last year and it was sooooooo fun. I'm not this year but I have had such a positive response to my Cinderella nails I did last year that matched my home-made (yep!) Cinderella running costume on Pinterest that I wanted to do a whole week of easy to do, princess insprired nails. I've said it before and I'll say it again. I'm no artist. So you won't be seeing any faces or elaborate detail on my nails. I try to take from the major points of the character and interpret them into an easy to do design! Let me know what you think! This week I'll be featuring Snow White, Belle, Ariel, and Cinderella. Cinderella is my fav, obviously, followed by Belle and Ariel. I'm a classics girl! Snow gets a ticket because she's and icon and the first Disney Princess :) If you guys like these and want me to do more leave a comment and maybe later in the year I'll do another week of different princesses! I tried to condense the pics into one collage, for simplicity sake. 1. start with black on the 1st and 4th finger, blue on one, and yellow on one, you don't have to do them in the same order or quantity even! 2. 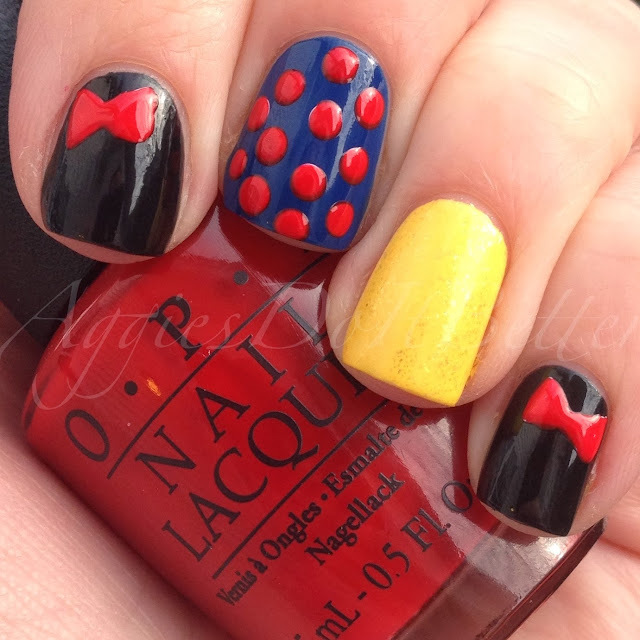 Place white dots on the blue nail. This is so the blue doesn't swallow up the red and really makes it pop. 3. When the white dots are dry, cover them with red. This nail represents her sleeve caps. 4. For the bow, trace an "X" shape. Same reason, the black will really swallow up any color you put on top of it. Use a small art brush or even a toothpick dipped in a tiny dot of polish. 6. When the white bow is dry, cover it in red using same technique. This nail represents her hair and bow. 7 & 8. Cover your yellow nail with any type of clear glitter topper. You can use China Glaze Fairy Dust if you have it, or any thing really. I almost did, but then decided to use this gold sparkley one. Polishes used, from L: OPI Thrill of Brazil, Keeping Suzi at Bay, I Just Can't Cope-Acabana, Sinful Colors 24 Karat, white Kiss striper, Sally Hanson Black out and White on.